Rosapenna Hotel & Golf Resort has been welcoming golfers to North West Ireland since 1893. The original course at Rosapenna was laid out by Old Tom Morris with significant revisions by Harry Vardon and later Harry Colt in the early 1900's. We found 7 offers matching your search. The legendary Old Tom Morris laid out the original links that bears his name in 1891. On his first visit to the area, Morris was struck by the quality of the ‘golfing canvas', and before he returned home he staked out the guidelines for his superb creation. In the following decades, both Harry Vardon and James Braid provided amendments, to make the golf course the outstanding challenge that it is today. With some 15 Open Championship titles between the three contributors, it should come as no surprise that the Old Tom Morris course is one of the finest in the north-west region. The greens are undoubtedly the highlight of the course, with Morris deeming the existing land so good that he only built 3 of the greens; all fifteen of the others are exactly as the land dictated. 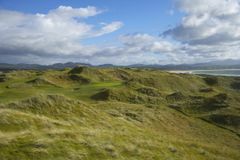 The addition of the Sandy Hills course in 2003 has only added to Rosapenna's reputation. While Morris' course skirts the fantastic dunes, Pat Ruddy has crafted a monstrous tournament links that cuts through the sandhills of the incredible landscape, that so captivated Old Tom over a century ago. Ruddy's masterpiece measures over 7,100 when stretched fully, but in line with modern design principles, a multitude of tees make it playable for golfers of all standards. With these two outstanding creations on an awe-inspiring stretch of turf, a golf break at Rosapenna is a truly magnificent experience. Intensive golf clinics are available, with expert tuition from the resident PGA professional. There is a fine array of rooms from which to choose, from the more than adequate standard, to the opulent senior suite, many of which boast staggering views across Sheephaven Bay. In addition to the comfortable accommodation, the dining and leisure facilities ensure that visitors remain well-cared for. Guests at Rosapenna can enjoy the indoor pool, whirlpool, steam room, or have a massage while the more adventurous may be interested in tennis, snooker, pony trekking, fishing and supervised diving. The proximity of the fishing village of Downings ensures that the speciality seafood at Rosapenna is as fresh as it comes.